Alpha is a real hoot. That much we already know. As the no-nonsense leader of The Whisperers, she has proven that she's a force to be reckoned with after just a handful of appearances. 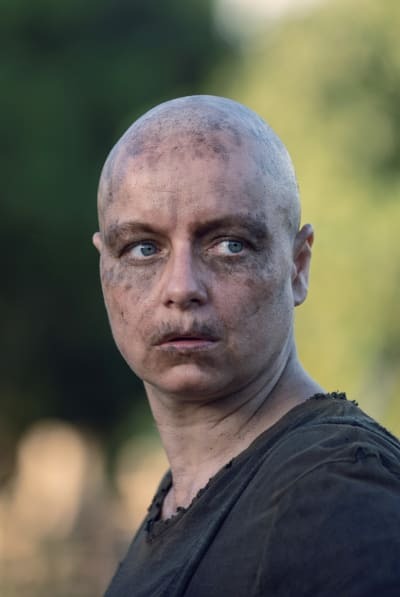 In a new scene from The Walking Dead Season 9 Episode 12, Lydia has a tense reunion with her mother after a successful trade with the Hilltop. Lydia is visibly frightened that her mother is going to strike her over the head again for calling her Alpha, but she listens anyway. Alpha wants her daughter to know that telling the Hilltop information is okay but wants to maintain that words can't be trusted because they're just words. It's certainly an awkward scene, and one we're not going to forget any time soon. Alpha thinks she and her people are well on their way to making it back to their own land, but little do they know that Henry is following them. Daryl and Connie are also in hot pursuit of Henry, so things are going to continue to get crazy. Alpha is not going to take too kindly to these people following her with the aim of getting close to her daughter. The Whisperers were happy to let a baby become prey to the undead, so that shows just how cunning they are. These villains can be in any place at any one time. Watch the full teaser below, and hit the comments with your thoughts on it. Remember you can watch The Walking Dead online right here via TV Fanatic. This episode airs Sunday at 9/8c. 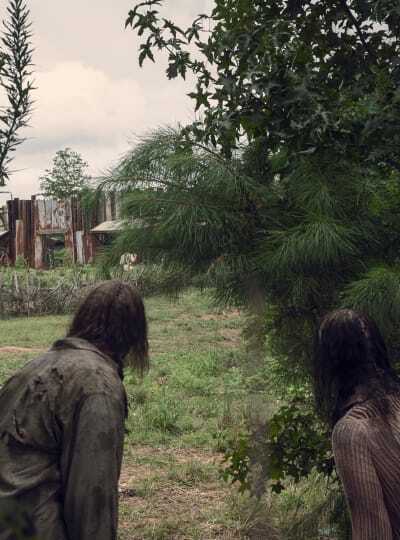 The Walking Dead Season 9 Episode 12: "Guardians"
Siddiq: I know that you just want what's best for us. But what does it mean for Alexandria to survive if means that the Kingdom falls? Michonne: It means Alexandria Survives. Permalink: It means Alexandria Survives. Eyes open. Where there's one, there's more. Permalink: Eyes open. Where there's one, there's more.